Specifically, plate V, upper right. There you see the "ws" scepter in association with two different orientations of the regnal year (presumably of Sneferu in this case). Alas, I fail to see this. Perhaps I am missing it. From right-to-left I see two upright ws sceptres (tho the lower one is somewhat curved) and these appear to be associated with what looks like the Djed pillar sign (Djedfre?). 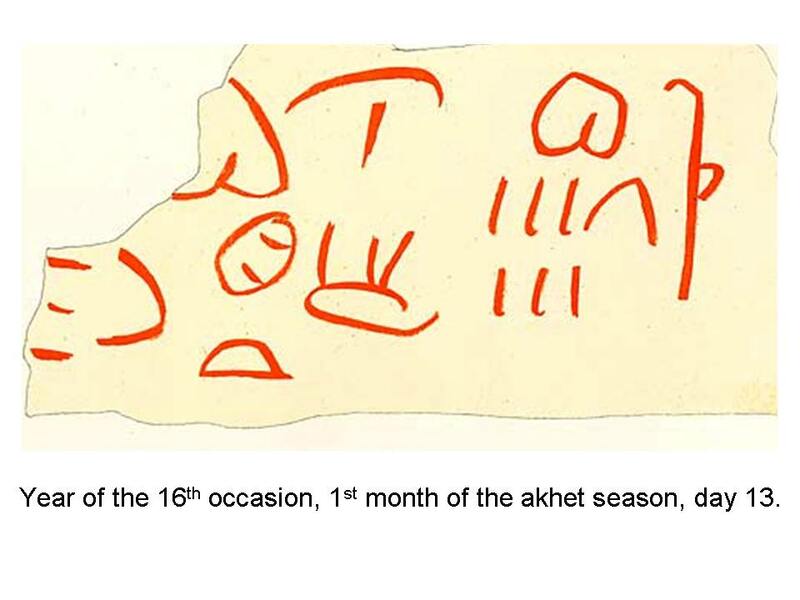 This is then followed with the year sign followed by various upright number signs which, in turn, are followed by the month sign (with the upright month number below) and finally the day number (written sideways). 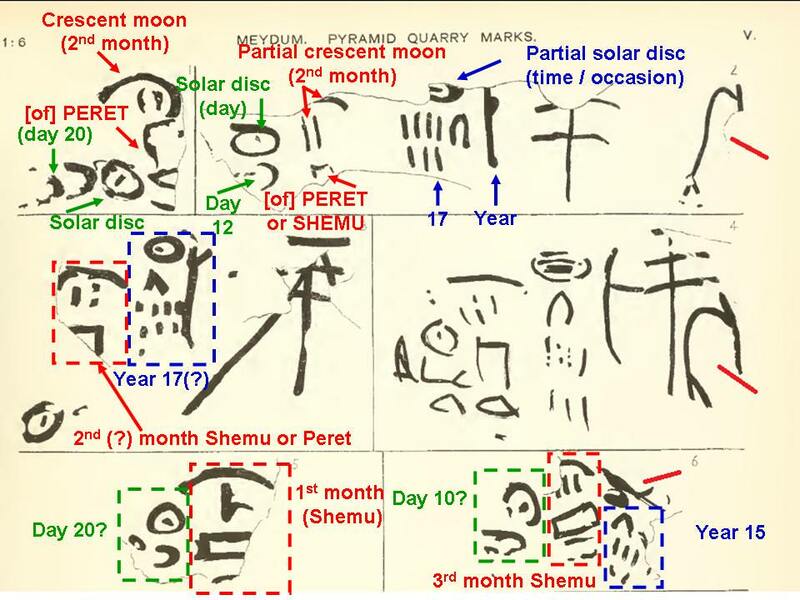 Always, it appears, when a day value is written it is written sideways and, from the evidence, appears always to be written along with the hieratic solar disc representing 'day'. Notice also that when a day is written using the sideways 'n' sign, the lower '--' unit values (sideways '|' sign) are to the left of the sideways 'n' sign, indicating their lower place value. In Campbell's Chamber the unit values would be below the sideways 'n' value which, going by the evidence above, does not appear to be the normal convention and even more so considering all of the inscriptions in these chambers are written linearly i.e. right-to-left (if written onto the blocks at a quarry). Not a single number sign in Campbell's Chamber (which some here are to be read sideways) has a solar disc associated with it like we observe in the markings above and also in Merer's Logbook. This is why I do not consider that the numbers painted onto the roof blocks in Campbell's Chamber are day values - there's no solar disc alongside any of them. As such they are to be read upright and are, therefore, patently wrong as the lower value would then be in the wrong place, being furthest right where the highest value should be. Edited 9 time(s). Last edit at 07-Apr-18 19:26 by Scott Creighton.